On October 6, Mercury passes between the Sun and Earth in a configuration known as inferior conjunction. That same day, NASA's MESSENGER spacecraft flies past the innermost planet for the second time this year. After inferior conjunction, Mercury moves west of the Sun and becomes visible in the morning sky within 10 days. By that time, hundreds of MESSENGER images should have been returned to Earth, many showing regions of the planet never seen before. On October 16, Mercury lies 8° above the eastern horizon 30 minutes before sunrise and shines brightly at magnitude 0.5. The key to good views of Mercury is its angular distance from the Sun. All else being equal, the greater this distance, the sooner the planet rises before our star (or the later it sets, in the case of evening apparitions). 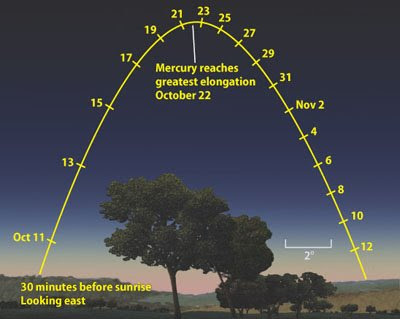 Mercury reaches greatest elongation October 22, when it stands 18° west of the Sun. This isn't the largest angular distance Mercury can achieve. The planet passed through perihelion, the closest point in its orbital path around the Sun, just 5 days earlier. Nevertheless, Mercury stands 5° high in the east an hour before sunrise October 22 and climbs another 6° in the next 30 minutes. It shines a full magnitude brighter than it did a week before and will be easy to find. On October 16, a telescope reveals the inner planet's 8"-diameter disk, which appears 27 percent lit. As the planet heads toward greatest western elongation, its disk shrinks and the illumination increases. By the 22nd, the globe appears 7" across and 55 percent sunlit. Mercury lingers through October's final week, when it will be easiest to see as it continues to brighten. On October 31, Mercury shines at magnitude -0.9. It lies 8° above the eastern horizon 30 minutes before sunrise. It also lies 4° north of Spica, the brightest star in Virgo the Maiden, that morning. Through a telescope, Mercury's disk is then 83 percent illuminated and 6" across. To find more observable objects in your sky, visit Astronomy.com's sky events calender.